Love this! It already has the basics for an insanely great kitchen. 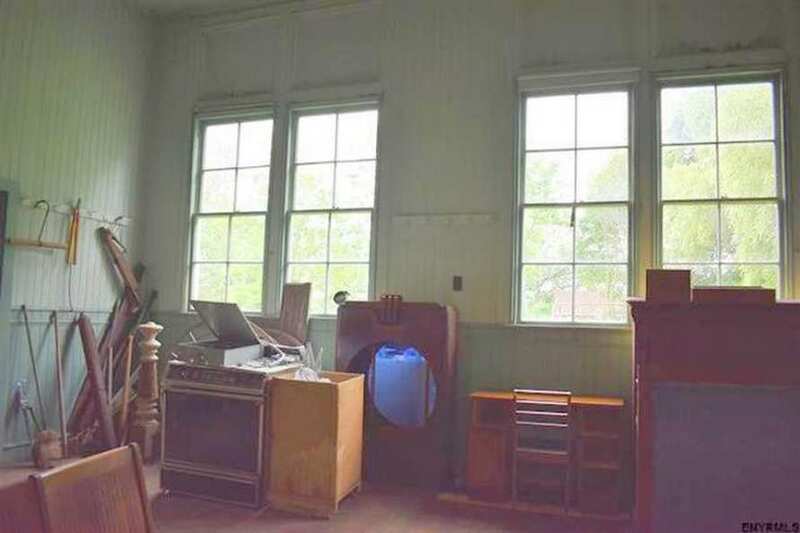 A ton of light from those big windows, yummy beadboard, nice old flooring. And it has an acre of country-enough land to feel peaceful but with neighbors & a few conveniences within easy reach. In commuting distance of Schenectedy and maybe Albany. I’d love to get my hands on this treasure; makes me wish NY state were a possibility for us. Yeah, my thoughts went straight to kitchen possibilities too. Oh! Can you imagine how cute the exterior will be? Oh my stars and garters! What a glorious find and the best good bones pallette of any old school I’ve ever seen! Oh, this is wonderful!Love the exterior especially! 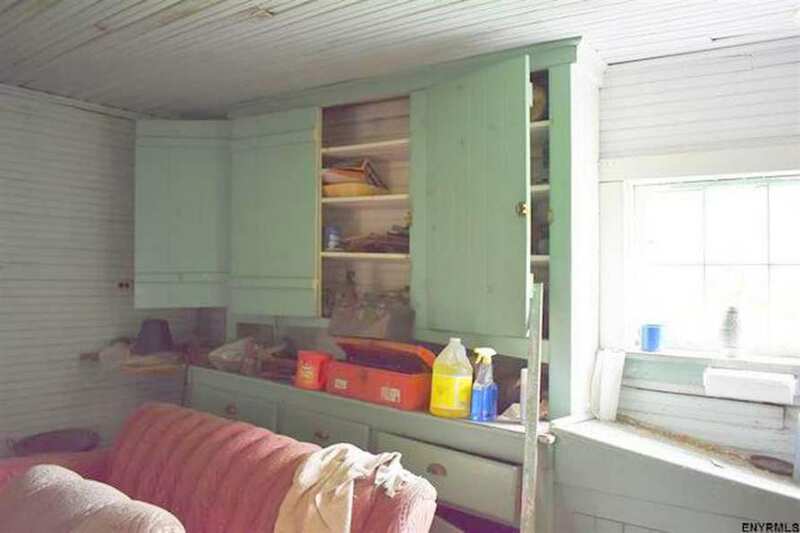 I had the (unauthorized) opportunity to view this property about 6 weeks ago, and it looks like they’ve done some cleanup since then. In fact, I took a bunch of photos, and will see if I saved them – if so, will send to Kelly. 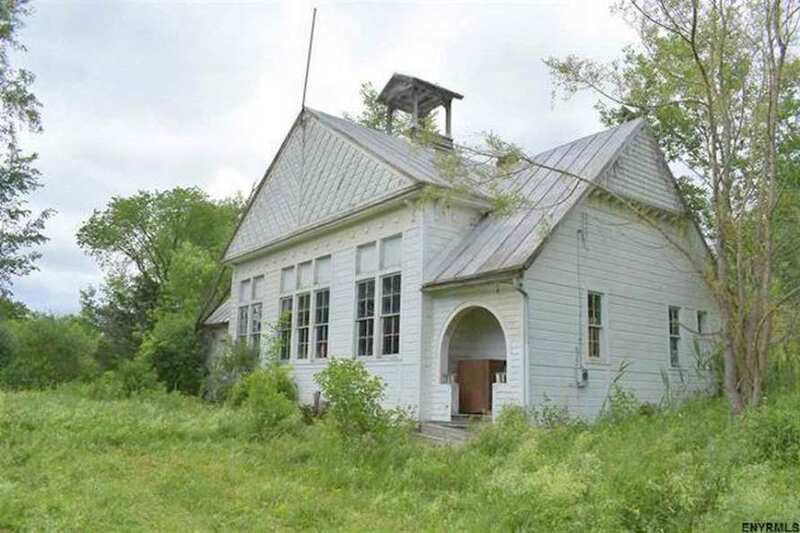 Oh, my bad – I confused this schoolhouse with a similar one that was for sale in the Montgomery County town of Florida, NY. Mea Culpa, and apologies to the real estate agent, who is probably having a well-justified fit. Oh my goodness! Now, if that expression doesn’t give away my age, I don’t know what does! I hope all the “stuff” comes with because some of it looks quite interesting. This would make a perfect art studio !!! My dream studio !!! Looks large enough to even have summer art camp for kids. This is such a great structure, I hope someone saves it. Love bead board and the coat hooks are fab. My eye went to the coat hooks and bead board too. So charming. Anyone know what’s up with the panels above the windows? In the old photos it doesn’t look like it used to be glass, but doesn’t look particularly decorative either. Think they long ago replaced larger windows with smaller? YES to all the amazing features people have already mentioned, but ALSO THOSE LIGHT FIXTURES! I am in love. I want to see this beauty all fixed up and surrounded by happy yellow rose bushes. This would be my dream house! So many possibilities! I missed seeing any chalkboards? That would be a plus for this old teacher! 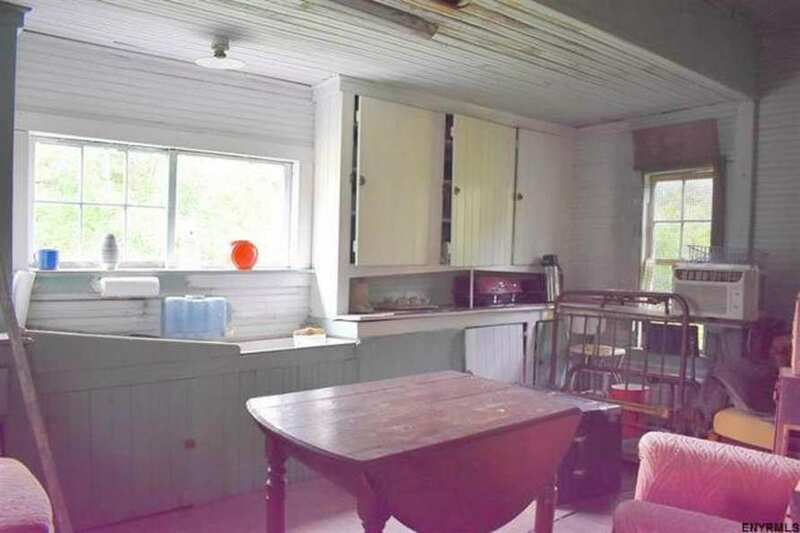 I love the old desks, the dollhouse, the steel and wicker chairs, the rocking red piano, and so much more. I think it needs a new bell immediately (at least, I can’t see one in the first photo). 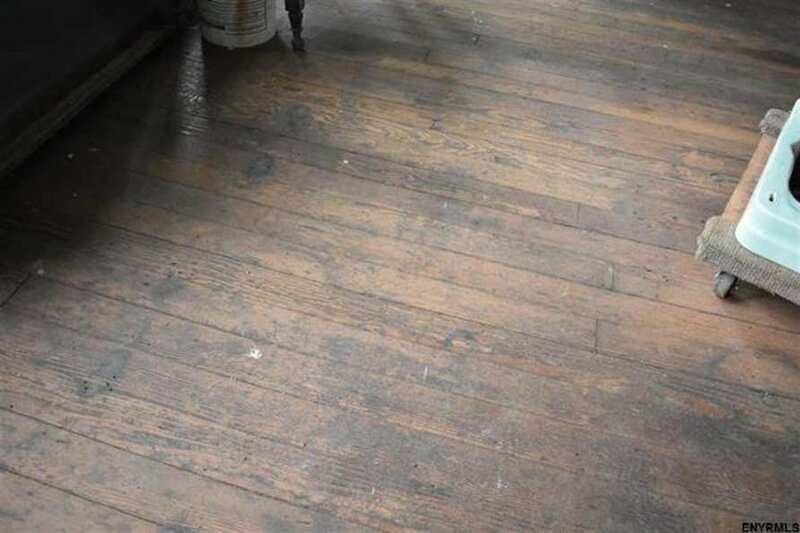 The floors look like they’d be beautiful with just a little work. Does anyone know what the tall green thing with the ladder leaning against it is, in photo 3? Is that a giant door? 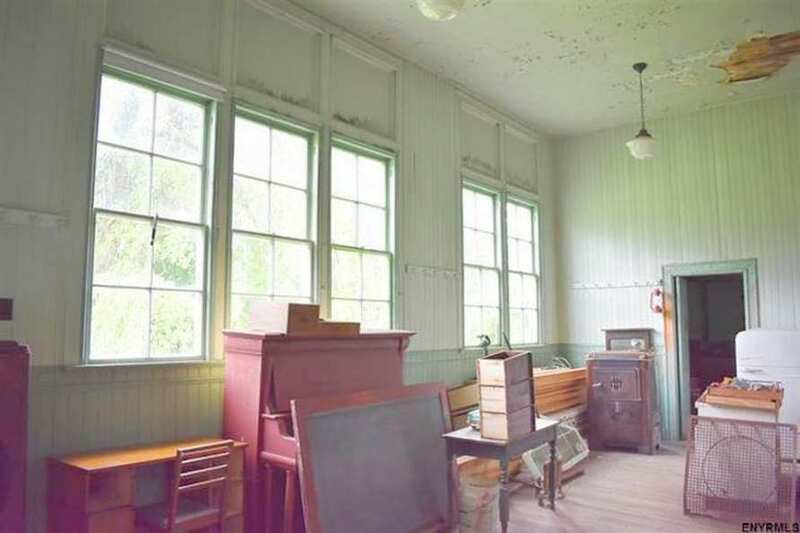 Also, what is the red and sort of glowing blue thing between the windows in photo 4? I love this, would love to see it painted not gray and landscaped. I wandered around the outside of this property yesterday…. It is quite large, much much larger than any of the surrounding homes. The main structure looks to be in surprisingly good shape. The added-on add-ons look much less sturdy. There is a brick chimney on the right side, perhaps indicating a great fireplace?? Sadly, there is no bell remaining atop the roof. 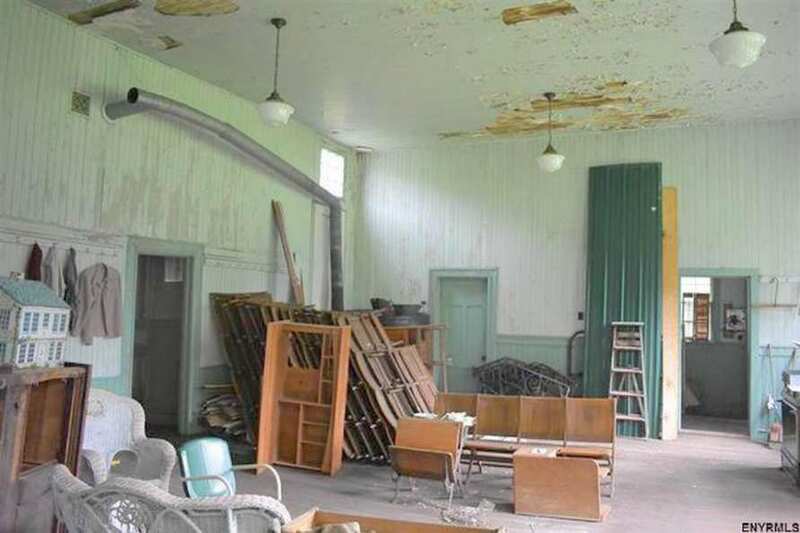 There are the remnants of an old metal swing set to the left of the building. And to the right is a small horse pasture. 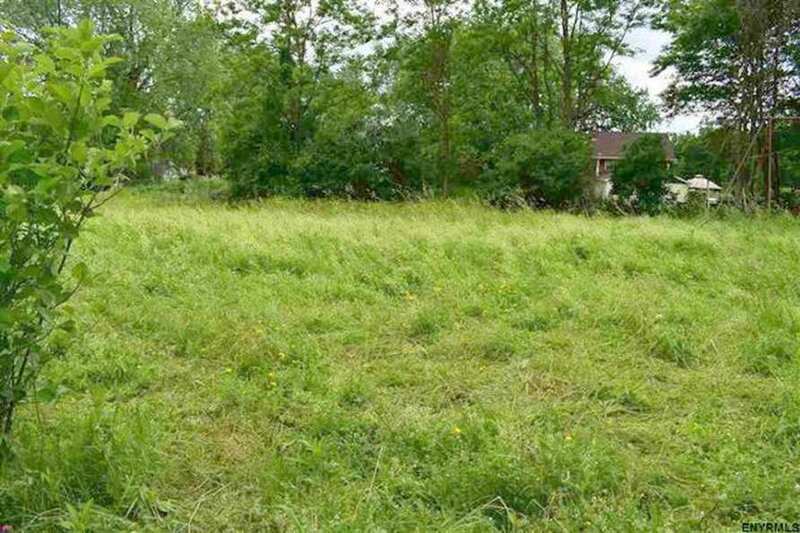 The price is high for the area, but oh what possibilities! Kfidei: I think the tall green thing you asked about is a piece of metal roofing. Prettypaddle: Those panels above the windows had me wondering the same thing! They look to be just a decorative feature. Wow, this is just lovely. Lots of lovely old furniture and furnishings still inside, too (buyers make sure you have those included in the purchase, I’ve seen things disappear when underhanded real estate agents are involved, including theft of tin ceilings). I’m moving back to Troy soon, I want to try and make a wee road trip to see this one and if I do I will report back.